When I rented my first apartment as a young adult, one of my favorite things was inviting people over for dinner. Dinner guests equaled a chance to try out new wines and cook inviting dishes. Not that I had a dining room table to eat on (or a dining room to eat it in), but I don't remember that mattering. Coffee tables, boxes, laps...they all worked equally well for setting plates on. Though I will admit to it being a little tricky when steak knives were involved. I can still remember planning my meals. I don't remember making many casseroles back then. And I rarely used my slow-cooker. Which is odd, because both of those methods make for somewhat easy "beginner" dishes. Instead, I almost always chose either a roast (chicken, beef, pork) or a dish that involved the searing of a piece of meat in a pan and deglazing with wine, or some other sort of liquid. But usually wine. I think sides were always some sort of potato and a veg. Probably a loaf of bread hanging around, too. And the funny thing is, those dishes were always a success. Some of my favorites were Ham Steaks in an Orange glaze, Chicken with 40 cloves, Burgundy Beef tips, Pork Chops in Rosé, and Tarragon Chicken. I don't remember ever not liking anything. Maybe everything just tastes amazing when you're young and on your own for the first time...as an adult (as opposed to a being a college student). Or maybe eating a good meal with good friends and a good bottle of wine is just timeless. It was probably a little bit of both. All of those meals remain some of my favorites today. 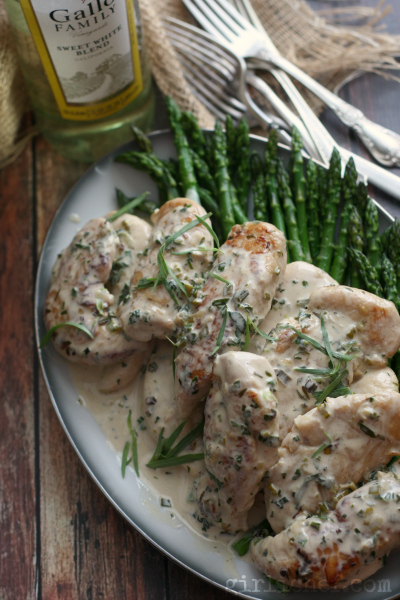 I've made Tarragon Chicken countless times over the years. I usually use chicken breast, but sometimes I use chicken tenders (like pictured here), or even a whole chicken (slightly different method). I've used vermouth, absinthe, and white wine as the liquid in the recipe, but today's version was made using Gallo Family's Sweet White Blend. 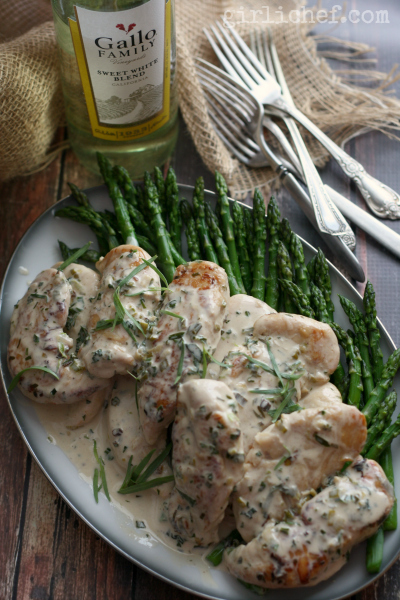 Piled high on a platter of asparagus and smothered in that flavorful sauce that brings back so many memories, it doesn't get much better. 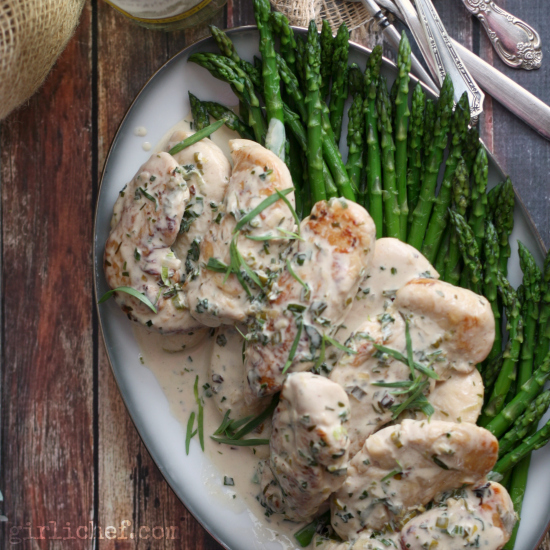 Tender chicken breast smothered in a creamy wine sauce laced with tarragon. Add oil and smashed garlic cloves to a large non-stick skillet and set over medium heat, moving garlic around. Once the oil is very hot, and the garlic has sizzled and started to turn golden, fish it out and discard it (it was just to lend a subtle garlic flavor). Add the scallions and dried tarragon to the oil and stir for 1 minute. 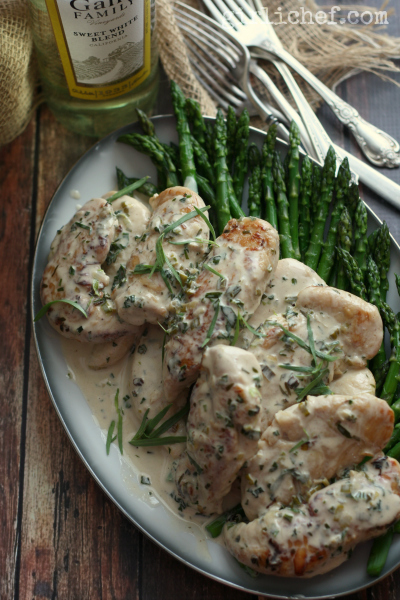 Sprinkle the chicken breasts with salt and white pepper and add to the pan. Cook for 5 minutes, or until golden and then flip. If the scallions seem to be getting dark, scoop them up and set them on top of the chicken. Add the white wine (or vermouth). Let it bubble up, then put a lid on the pot, turn the heat to low, and simmer for 10 minutes. At this point the chicken should be cooked through. Remove the chicken from the pan and set on a warm plate. Bring liquid to a boil for 1 minute. Add the heavy cream and tarragon and stir. Taste and adjust with salt and white pepper, if needed. At this point, you could set the chicken back into the sauce to coat it, then plate it up and pour the remaining sauce over it (or simply plate and coat in sauce). Sprinkle with a dish of extra tarragon and enjoy!